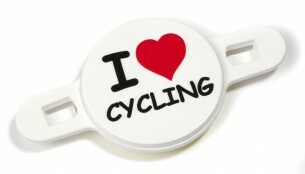 Need a cheap, fun and branded promotional give away item for a sporting/cycling or outdoor event? Why not print your full colour logo to this spoke badge? The print able area is 50mm diameter. To be put on the wheel of the bike, made in the UK from recycled plastic, so an eco friendly item. Available in a variety of colours.